Sophomores AJ DeGrande and Emma Jones lead the Indians into a spirited new year. 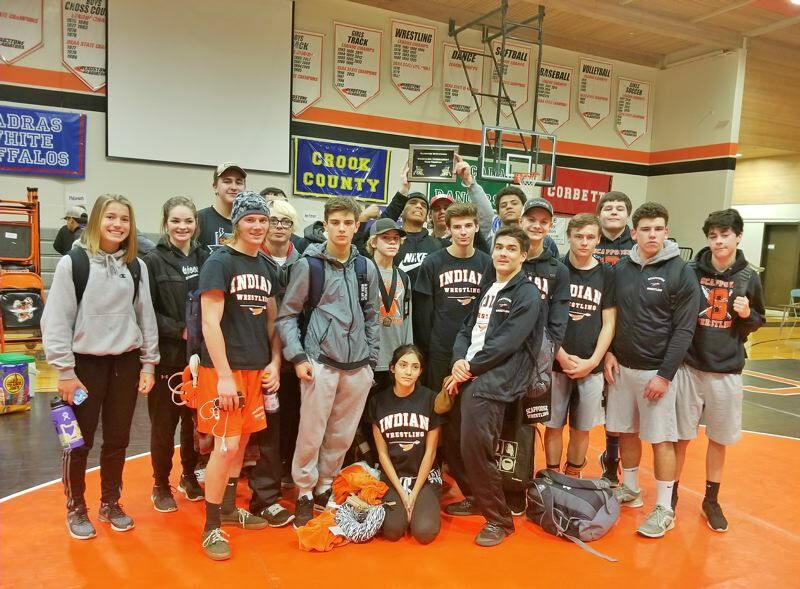 DeGrande beat Yamhill-Carlton freshman Reily Liesegang in the boys' 106-pound championship, and Jones sealed a three-pin sweep of the girls' 110-120 crown against Elmira junior Elva Zhao at the Gladstone Tournament Thursday, Dec. 21, at Gladstone High School. "AJ competed well in all of his matches at Gladstone," Scappoose coach Nick Byrd said. "He is really opening up and developing his offense, which is good to see at this point in the season. Emma is an extremely tough competitor. She is going to win matches on toughness alone, but it is awesome to see the work she has been putting in to develop into a high-level wrestler." DeGrande lifted his record to 17-2 with wins over freshmen Anthony Branch (Class 6A Jefferson, 19-4 technical fall), Jose Flores (Taft) and Matthew Carillo (Sutherlin) via 16-4 major decisions, and Liesegang 12-6. Jones, the lone Scappoose challenger in her field of four, eclipsed Class 6A talents Sarah Baltazar (a Century senior) in 49 seconds and Miacela Nicado (a David Douglas sophomore, :52) on the way to Zhao (5:54). Colton Frates (113) and Steven Hensley (138) reached second against juniors Dustin Asher of Molalla (4:40) and Brenden Hawkins of Class 5A Putnam (4:00), and all 17 Tribe boys who entered placed in a 264-point first-place tie with Putnam. "I was really proud of the way our entire team competed," Byrd said. "It is hard to wrestle five quality matches in a day, and most of our guys did well under the increased workload. We don't put a ton of stock into winning early-season tournaments, but it is always nice to bring home some hardware after a tough-fought tournament: I feel it reflects a lot of the hard work being put into the room on a daily basis." The Indians are scheduled to open 2018 at the Pacific Rim Tournament Jan. 5-6 in Seaside. Round 1: DeGrande received a bye; Round 2: DeGrande def. Anthony Branch, Jefferson, technical fall, 19-4; Round 3: DeGrande def. Jose Flores, Taft, major decision, 16-4; Championship bracket: DeGrande def. Matthew Carrillo, Sutherlin, major decision, 16-4; First-place match: DeGrande def. Reily Liesegang, Yamhill-Carlton, 12-6. Round 1: Dustin Asher, Molalla, pinned Healey, 1:24; Round 2: Healey received a bye; Round 3: Jacob Jarvis, Yamhill-Carlton, pinned Healey, 2:37; Consolation bracket: Healey received a bye; Fifth-place match: Healey def. Logan Cave, Elmira, major decision, 13-1. Round 1: Frates received a bye; Round 2: Frates pinned Logan Cave, Elmira, 3:10; Round 3: Frates def. Jared Dyer, Newport, technicial fall, 15-0; Championship bracket: Frates def. Jacob Jarvis, Yamhill-Carlton, 5-1; First-place match: Dustin Asher, Molalla, pinned Frates, 4:40. Round 1: Cai Pai Varinta, Jefferson, pinned Merrow-Hansen, 5:32; Round 2: Ayden Wolgamott, Elmira, def. Merrow-Hansen, 6-2; Round 3: Merrow-Hansen pinned Evan Wiley, Neah Kah Nie, 3:56; Consolation bracket: Merrow-Hansen pinned Hunter Davis, Elmira, 3:59; Fifth-place match: Merrow-Hansen pinned Evan Wiley, Neah Kah Nie, 1:01. Round 1: Kauffman pinned Jed Smith, Astoria, :31; Round 2: Keltin Benson, Philomath, def. Kauffman, 8-4; Round 4: Brenden Hawkins, Putnam, def. Kauffman, 8-1; Round 5: Kauffman def. Case Wells, Sutherlin, 6-0; Fith-place match: Kauffman def. Morgan French, Philomath, technical fall, 20-4. Round 1: Hensley def. Dalton Somers, Astoria, technical fall, 16-1; Round 2: Hensley pinned Jaime Garcia, Yamhill-Carlton, 4:32; Round 4: Hensley def. Morgan French, Philomath, major decision, 15-4; Round 5: Hensley def. Eochaid Fry, Neah Kah Nie, major decision, 12-4; First-place match: Brenden Hawkins, Putnam, pinned Hensley, 4:00. Round 2: Kauffman received a bye; Round 3: Kauffman, pinned Dominic Eatherton, Molalla, :49; Quarterfinal: Kauffman pinned Devon Lindquist, Taft, 3:19; Semifinal: Owen Amerson, Yamhill-Carlton, pinned Kauffman, 1:48; Third-place match: Tariq Armstrachan, Jefferson, pinned Kauffman, 1:25. Round 1: Owen Amerson, Yamhill-Carlton, pinned Spiller, :49; Round 2: Spiller pinned Hayden Doran, Sutherlin, 2:00; Consolation round 1: Spiller def. Matthew Hamlet, Philomath, 7-0; Consolation round 2: Spiller def. Dominic Eatherton, Molalla, 8-4; Ninth-place match: Spiller def. Brandon Harrington, Molalla, 7-6. Round 1: Jackson pinned Dakota Honl, Jefferson, 1:03; Round 2: Jackson pinned Dylan Donnell, Philomath, 3:59; Round 3: Ben Pruitt, Molalla, pinned Jackson, 1:24; Championship bracket: Ryan Mount, Molalla, pinned Jackson, 1:35; Third-place match: Isaac Cook, Scappoose, pinned Jackson, 1:22. Round 1: Cook def. David Jin, Taft, 7-4; Round 2: Cook def. Brandon Nguyen, Putnam, 12-9; Round 3: Ryan Mount, Molalla, pinned Cook, 1:33; Championship bracket: Ben Pruitt, Molalla, pinned Cook, 5:45; Third-place match: Cook pinned Trevor Jackson, Scappoose, 1:22. Round 1: Eggers received a bye; Round 2: Eggers received a bye; Round 3: Eggers def. Bryce Anderson, Sutherlin, major decision, 19-9; Championship bracket: Giovanni Hernandez, Putnam, def. Eggers, 10-7; Third-place match: Eggers pinned Ayite Mettle, Newport, 2:53. Round 1: Mikey Montgomery, Elmira, pinned Jamerson, :33; Round 2: Jamerson pinned Hunter Strong, Sutherlin, 3:11; Round 3: Jamerson pinned Jace Fostveit, Taft, 5:32; Consolation bracket: Jamerson def. Travis Bennett, Neah Kah Nie, major decision, 13-0; Fifth-place match: Jamerson pinned Zachary Culver, Yamhill-Carlton, 3:43. Round 1: Zachary Culver, Yamhill-Carlton, pinned Kreiger, :49; Round 2: Justin Bean, Putnam, pinned Kreiger, 1:49; Round 3: Kreiger pinned Chris Byrum, Taft, 2:16; Consolation bracket: Jace Fostveit, Taft, pinned Kreiger, :59; 11th-place match: Kreiger pinned Zach Howell, Putnam, 5:59. Round 1: Kessi def. Brett Hinsley, Jefferson, technical fall, 15-0; Round 2: Kessi received a bye; Round 3: Jacob Wanlass, Gladstone, pinned Kessi, 1:08; Consolation bracket: Kessi pinned Kalvin Schunn, Philomath, 1:19; Fifth-place match: Kessi pinned Bo Edwards, Molalla, 1:54. Round 1: Cleveland, received a bye; Round 2: Tristan Bennett, Neah Kah Nie, pinned Cleveland, :39; Round 3: Cleveland def. Jimmy Acevedo, Newport, 9-2; Consolation bracket: Cleveland def. Jared Minter, Philomath, 6-2; Fifth-place match: Cleveland pinned Zackary Rodriguez, Yamhill-Carlton, 3:56. Round 1: Sandstrom pinned Keeny Deutsch, Newport, :44; Round 2: Sandstrom received a bye; Round 3: Andrew Smalley, Sutherlin, pinned Sandstrom, 3:17; Consolation bracket: Sandstrom pinned Timothy Price, Jefferson, 3:15; Fifth-place match: Sandstrom pinned Josiah Rodriquez, Yamhill-Carlton, 1:07. Round 1: Danny Aguilar, Putnam, pinned Archer, 2:47; Round 2: Noah Estes, Philomath, pinned Archer, 3:07; Round 3: Archer received a bye; Consolation bracket: Jonathan Lommen, Neah Kah Nie, pinned Archer, 1:14; 11th-place match: Archer pinned Keeny Deutsch, Newport, 1:05. Round 1: Jones pinned Sarah Baltazar, Century, :49; Round 2: Jones pinned Miacela Nicado, David Douglas, :52; Round 3: Jones pinned Elva Zhao, Elmira, 5:54.